In Part I of this series, Bonddad and I looked at the years 1929 - 1933. These years saw a decline of 25% in the chained GDP figures; a failure of 20% of commercial banks, a drop in personal income from $90 billion to $50 billion and a drop in the level of industrial production from 60 to 30. The contraction was the most severe of the last 100 years. 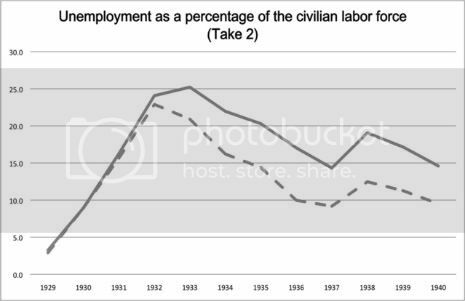 Let's take a look at years 1934 - 1940 to see how the economy performed. The Hundred Days were only the start of a process that ended by transforming American society. 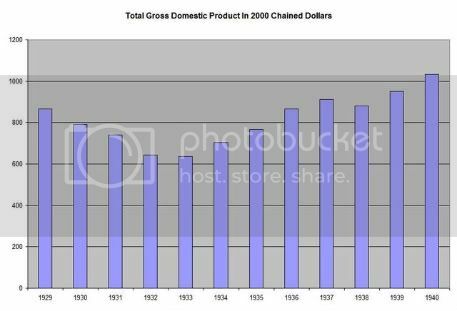 Above is a chart from 1929 - 1940 of total US GDP in chained 2000 dollars. Notice a very important point: the US economy had increased in size from 1934 to 1937 to its 1929 level. In other words, the US economy wiped out the total losses of the 1929 - 1933 contraction in 4 years. 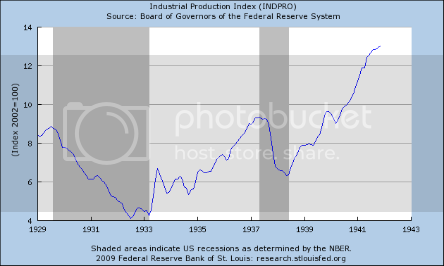 1936 866.6* In 1936, real (inflation adjusted) GDP surpassed that of 1929! Auto sales in 1936, at 4,616,000 cars and trucks, of which 3,807,000 were passenger cars, surpassed the 1928 level of 4,599,000 cars and trucks, trailing only the 1929 sales of 5,651,000 cars and trucks. The economy grew 10.8% in 1934, 8.9% in 1935, 13% in 1936 and 5.1% in 1937. Consider these achievements in the face of the claim by the right wing noise machine that FDR extended the Great Depression. These claims are entirely false based on the above data. In fact, it was a mere three years before the economy had again increased to its 1929 level, indicating something was indeed working. 1.) 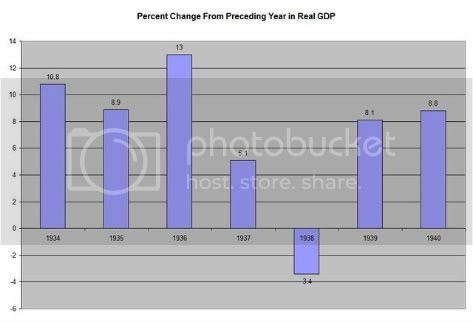 The US economy lost roughly 1/4 of its GDP from 1929 - 1933. In other words, FDR started in one of the deepest economic holes faced by any new administration. 2.) By the end of his first administration he had returned the country to its 1929 level of GDP and employment. He did this with a rapid rate of economic growth as evidenced by the raw GDP growth numbers and decent employment growth. Here's an explanation from Paul Krugman on what happened. In 1934 and 1936, the GOP made many of the same arguments against the New Deal that the RW echo chamber is parroting now. Those arguments were considered by the electorate and their verdict was overwhelming: in a rare occurence, the incumbent Democratic party increased its seats in both the House and Senate in the off-year 1934 election, and FDR won a landslide re-election victory in 1936. Stay tuned for parts III and IV. FDR's change in US society made a true middle class, more just and then.....corporate/special interests started really eroding many of the key pillars starting with Nixon. So, wala, we're back where our great/grand parents come from. If there is anything that disturbs me the most is how as I've aged, I've watched that sense of fairness, of a job, of a sense of lifestyle for working America erode and along with it the society of America. I can remember when layoffs were horrific, when corporations didn't fire people at random and fire people routinely because they were over the age of 40. A host of things I feel is directly attributable to the attack on FDR restructuring done in the 1930's.